Greetings from Washington, DC! 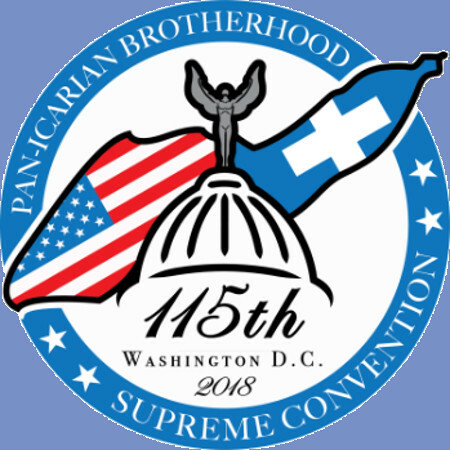 It is with great pleasure that Chapter 16 Lefkas-Baltimore/Washington of the Pan-Icarian Brotherhood will be hosting the annual Pan-Icarian Convention in Washington, DC during Labor Day weekend in 2018. We promise to make your DC experience a memorable one. There will be true Icarian glendi, warm Icarian-style hospitality and countless Smithsonian museums, historical monuments, plus other amazing attractions for you to visit during your stay in DC! Over 450 tickets already sold! Avoid the lines! Buy online and have your tickets on your phone or to print at home! All Events are in the Grand Hyatt Washington unless otherwise stated. Events highlighted in yellow require tickets to be purchased online (recommended, as some events have limited capacity) or at the door. Times and Locations within the Grand Hyatt Washington TBA. Group will depart from hotel lobby at 6:00 PM to watch the Washington Nationals battle newly-acquired slugger Mike Moustakas and the Milwaukee Brewers. Purchase tickets through us to exchange for tickets in the Pan-Icarian block. Join us to welcome our fellow Kariotes. Cash Bar with Light Hors d'oeuvres. Ultra Bar Nightclub is just two blocks away from the hotel. 18 to Dance and 21 to Drink with Proper ID. RJ Lisander of Lotus Seed Meditations leads an accessible all-levels yoga flow designed to invigorate the body and focus the mind to prepare practitioners for the day ahead. All are welcome. While a limited number of yoga mats are available at the hotel, those with a regular practice are encouraged to bring their yoga mat to the session. RJ Lisander of Lotus Seed Meditations leads this all-levels class geared toward a fun, friendly and playful practice open to all ages, perfect for those who are planning a day of activities in and around the DC area. Accessible to young and old, novices and more experienced practitioners, this session will include an optional 15-minute guided meditation from 10-10:15 am. While a limited number of yoga mats are available at the hotel, those with a regular practice are encouraged to bring their yoga mat to the session. Meet in hotel lobby at 1:30 PM. Tours will begin at 2:00 PM and 2:15 PM. Capitol is a 20 minute walk or take the Metro and walk a few minutes to Capitol. The tour is free but you must reserve a ticket online through the ticket purchase page as there is limited capacity. Join your fellow Kariotes as they read poetry. No tickets required, but if you wish to reserve a slot to read poetry, please reserve your spot using the ticket purchase form. Departures for Divine Liturgy begins at 9:00 AM. Complimentary transportation provided by Chapter 16 Lefkas. Lefkas Chapter sponsored bus will shuttle guests to and from the National Zoo from 10:00 AM to 4:00 PM. Those wishing to go separately can hop on the Metro to the Smithsonian National Zoo. Meet in hotel lobby at 1:00 PM. First hour begins with cocktails, followed by a few speakers and a lovely dinner. Admission to Sunday Night Glendi is included with ticket. Those attending the Grand Banquet are encouraged to purchase their tickets in advance to select their tables online and coordinate with their family/friends to ensure everyone purchases seats at the same table. While tickets for most events will be available at the door, we encourage our delegates and guests to purchase their tickets in advance to avoid any delays purchasing their tickets onsite, get table assignments for the Grand Banquet, and streamline entry at the door, as electronic tickets will be emailed to you upon purchase to present for scanning at the door off your phone or by printing them out at home. Rooms have been reserved in the Pan Icarian Brotherhood of America – Chapter Lefkas – Washington-Baltimore Block using this link starting at $179 a night! Those wishing to make reservations over the phone can call (202) 582-1234 and specify the Pan Icarian Brotherhood of America – Chapter Lefkas – Washington-Baltimore rate to secure your room. Room rates available while supplies last!